I had the Hosmer Hound Dog (bacon, peanut butter, and hot dog) and tasted my friend’s Heidelberg (apple cider kraut, german beef and potato sausage, locally made relish, and spicy mustard) and was loving every bite. This was the first meal of the trip and might just be one of my favorites overall. I liked this but didn’t love it. Ice Cream Social has a great logo, a sweet but sparsely decorated space, and the usual flavors you’d expect from an ice cream shop with a few rotating flavors. I had cookies and cream in a cone and I feel like one visit to this restaurant was probably enough. The ice cream lacked in flavor and the cone was a little bland as well. Coffeeeeee. This is a great spot to sit and crank out some work. I had an iced vanilla latte and spent a few hours working on Hoot & Holler business. The latte was fine but the real draw was the great space they have and a quiet and focused ambiance. I popped in here for lunch and was absolutely blown away by the sandwich I chose to eat. Appropriately named “the stinker”, this gem was made with peanut butter, blackberry preserves, bacon, and blue cheese on a multi-grain bread. It sounds odd but was out-of-this-world delicious and the lavender dry soda I had with it was the icing on the cake! I wanted to love this restaurant. The menu looks amazing and the location is next to Stadium High School which is gorgeous, but the overall experience here fell flat. I ordered the Eggs Benedict and was served a plate of eggs that were overdone, burnt potatoes, and a hollandaise that never quite emulsified. The accompanying service was spotty and slow. I will say that when we drew our servers attention to the disappointing meal she was extremely apologetic and ended up comping most of the meal. I hope they were just having an off morning because it seems like they had all the makings for success! I love thai foooooood. LOVE IT. I LOVE IT SO MUCH. We split the pot stickers and an order of pad thai and I was not let down. 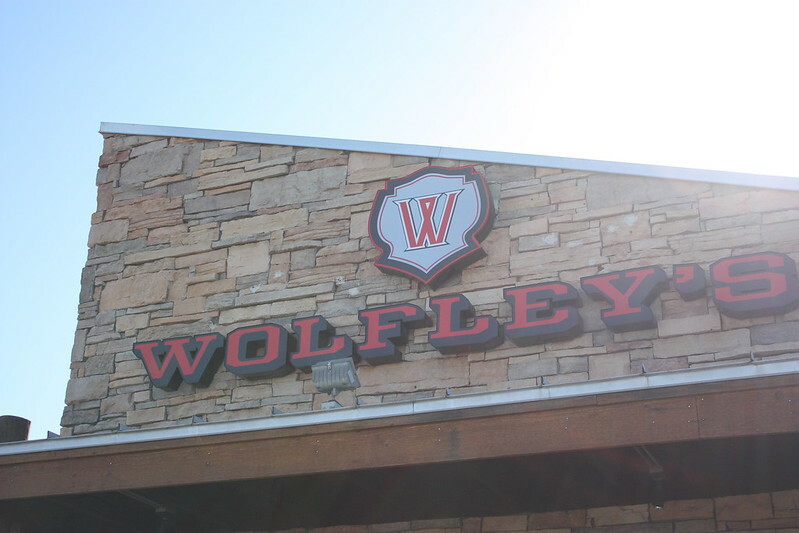 It’s an excellent little spot with large plates, a great view, and quick, attentive service. I’d absolutely go back! Yum. I’d call this the best meal of the trip and I didn’t even order food for myself. We stopped in here for a drink and ordered the duck tacos and I cannot stop thinking about them. Perfectly cooked duck served with gooseberries and a fig jam. 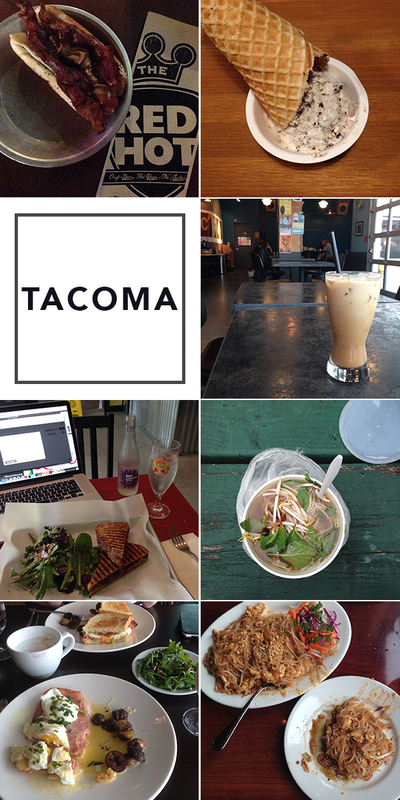 The drinks were out of this world and I would probably live there if I called Tacoma my home. I was craving pho in a really ugly way the first half of this trip so I snagged some pho and ate it in the park one night. It was pretty standard as far as pho goes but if you’re in the mood it’ll hit the spot for ya. The real highlight of this experience was eating it in the park. I’ve wanted to visit Olive and Ivy for years. A friend of mine in high school used to rave about this well-decorated spot and I was thrilled to finally dine there over the weekend. As far as atmosphere goes, I’ll give Olive and Ivy a perfect 10. It’s beautiful. A friend of mine and I stopped in for brunch and kicked off our meal with some mimosas. At Olive and Ivy they use prosecco in their mimosas which, I think, gave it a great flavor. I’ve had one too many of these made with cheap champagne so the prosecco was a nice touch! 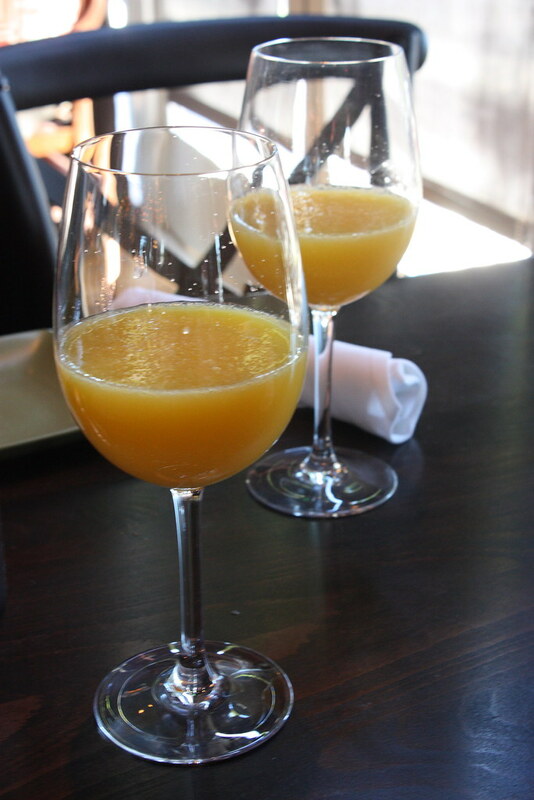 They were running a brunch special so our drinks were only $5 each–not too shabby. Plus, our attentive and friendly waiter mixed them at our table which was a great touch. The menu is full of delicious sounding meals. Eggs Benedict with basil hollandaise? Yes, please. Not only do they serve plenty of breakfast foods but they also have salads and an array of unique flatbread pizzas that are still making my mouth water. I ended up ordering Ivy Sausage Sandwich and my friend who has gone gluten-free chose the two egg breakfast. I couldn’t wait to dig into my food and while we were waiting we snacked on complimentary Parmesan pesto with sea-salt foccacia bread. Sadly, I think the pesto was the highlight of my meal. My sandwich was pricey ($10) and very average. The sausage had a nice flavor to it, the cheese was fully melted, and the english muffin was made in-house but there was no wow-factor to any of it. My friend wasn’t all that impressed with her food either. I was disappointed because the quality was there, it was pretty to look at, but the flavor was just lacking. Would I go back again? Yes. I’m absolutely willing to give them another try but next time I think I’ll go for lunch or dinner. If nothing else I think meeting some girl friends for appetizers and drinks would be so much fun in this sweet space. Sorry Olive and Ivy, this meal just didn’t do much for me! 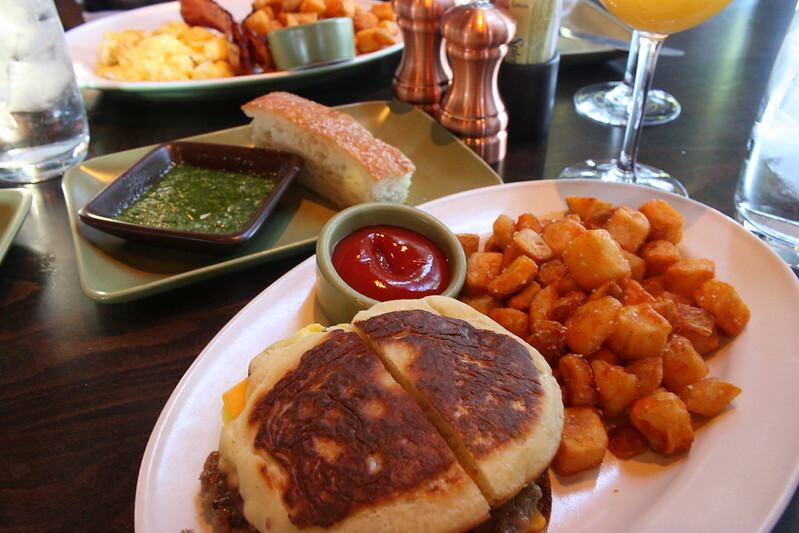 I’ve been eating out more recently because a brunch date at a new restaurant is the perfect way to catch up with good friends…obviously. My friend Morgan and I met at The Herb Box in old town Scottsdale to eat some amazing food and exchange our gifts during the Christmas season (you’ll see the beautiful scarf she got me in future fashion posts…I’m in love). 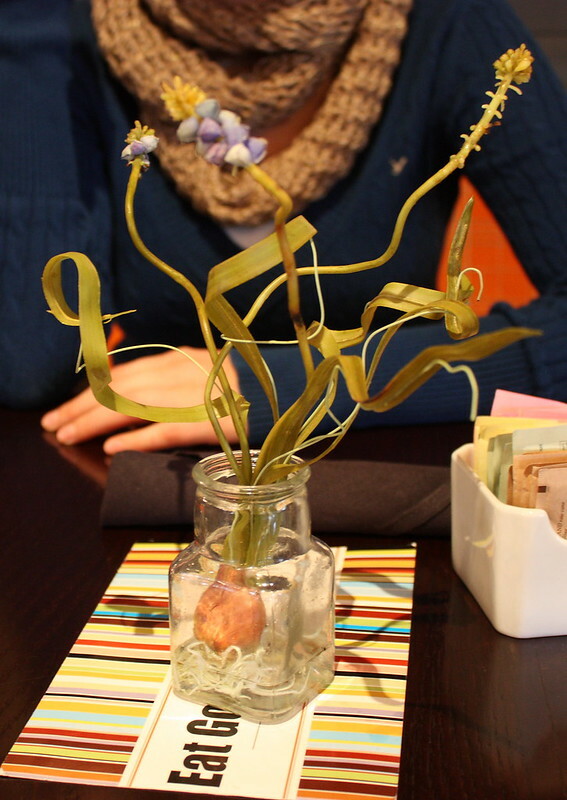 The best way to describe the ambiance at the Herb Box is by calling it classy nautical. There are small details like mirrors hung with rope and the wooden panels on the walls that make you feel as though you’re by the sea. 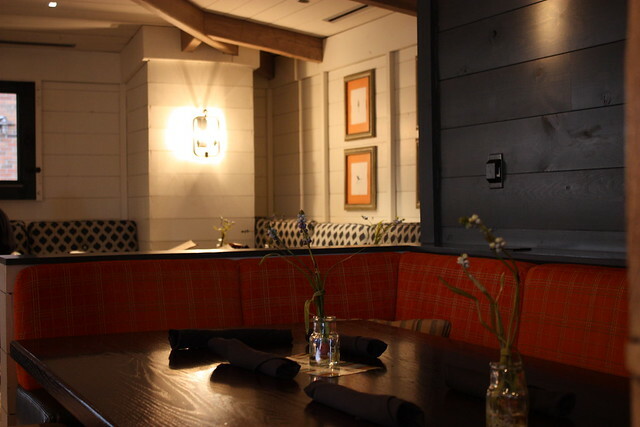 But then there are whimsical flower arrangements on each table and a really sophisticated color scheme (think navy, white, burgundy, and natural wood), and some of the most beautiful lighting fixtures that make the restaurant truly beautiful to be in. The volume level is also just right which I really appreciate. No one likes to yell across the table through a meal. 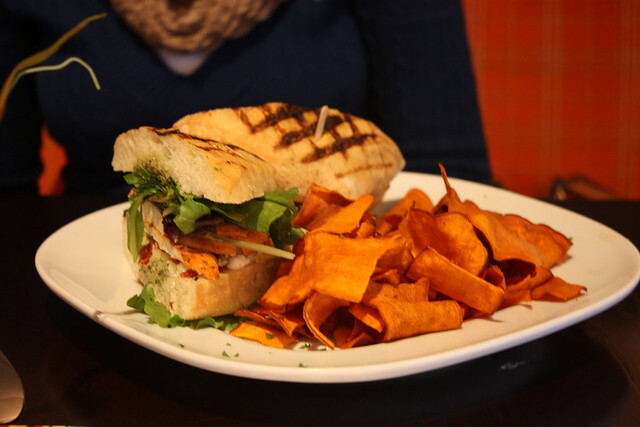 I ordered a goat cheese and roasted corn flatbread and Morgan opted for a grilled chicken and sage pesto sandwich. 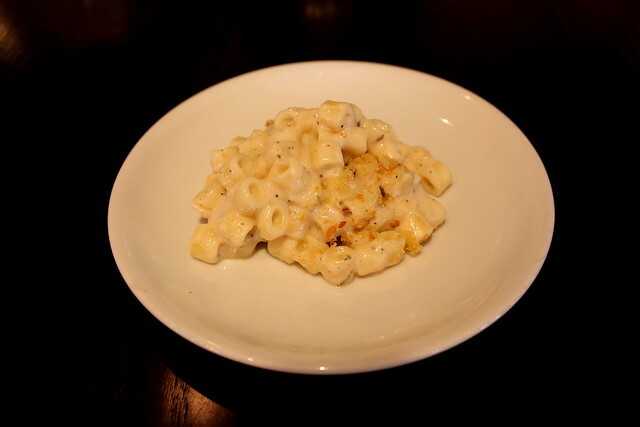 To start, we split the smoked gouda mac n’ cheese. All three dishes were ahhhhmazing. 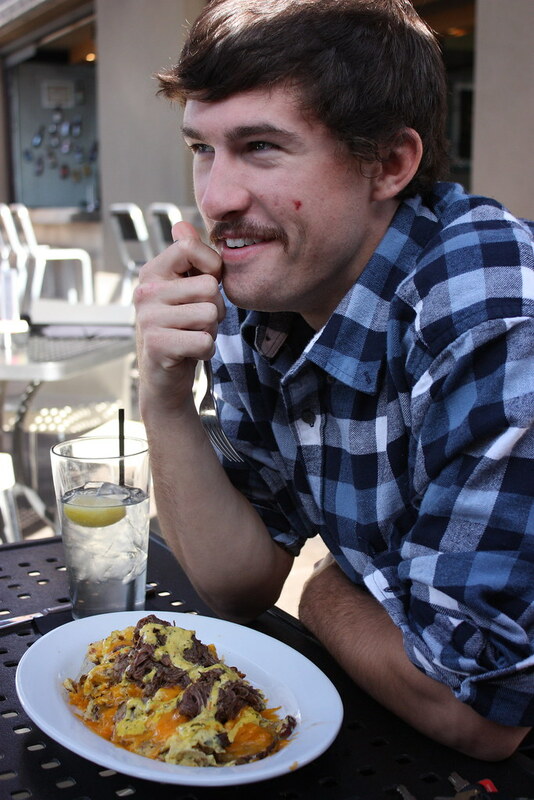 The mac n’ cheese was good but not great. It had a bit of a spice to it (very peppery) and was cooked well but I’m more of a classic, home-style mac n’ cheese kind of girl (give me the cheddar). Ever since I started working with Upward Projects I’ve been eating pizza a few times a week at our pizza place, Federal Pizza. But for some reason, I’m not burnt out yet. 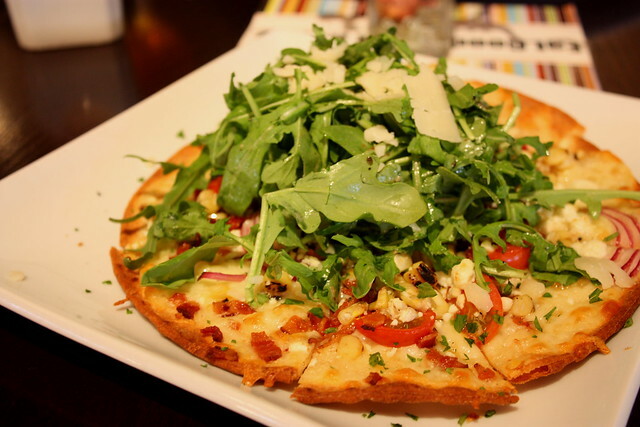 The crust on this flatbread was crisp, not soggy, and the grilled corn was such a great topping. I think there might have been a few too many greens on top but the didn’t detract from the overall flavor–just made it difficult to eat. Morgan raved about her sandwich. It was HUGE so she had plenty of leftovers for a midnight snack. Her side of sweet potato chips were divine (I may have stolen a few). I will absolutely be back to the herb box in the future. It’s a bit on the expensive side but is such a lovely place to treat yourself! 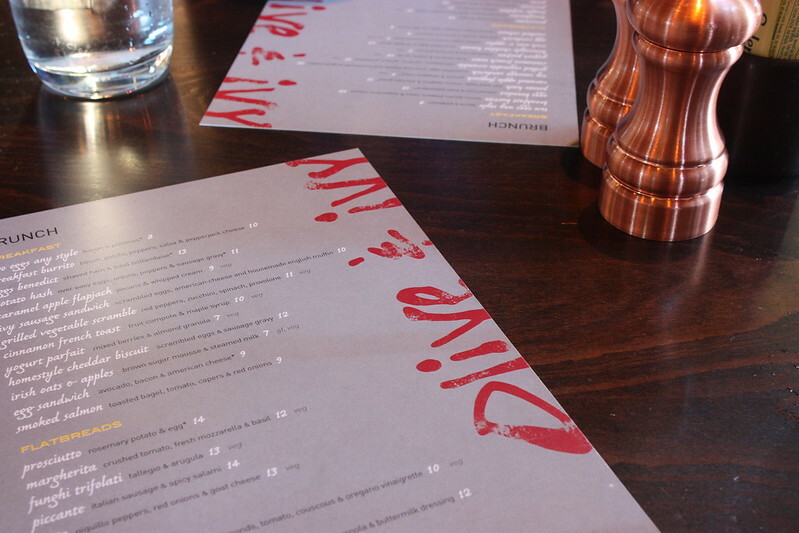 On Tuesday I met up with a friend of mine to tackle my never-ending restaurant list. I have this giant excel document full of restaurants I’d like to try categorized by location, type of food, and name. I’m kind of crazy but let’s skip past that to the part where I shared that list with my friend Joey who has now made it his mission to go with me to as many of these restaurants as possible. It’s been a SLOW process (read: we’ve only been to two so far) but I’m excited to tackle the rest of the list. 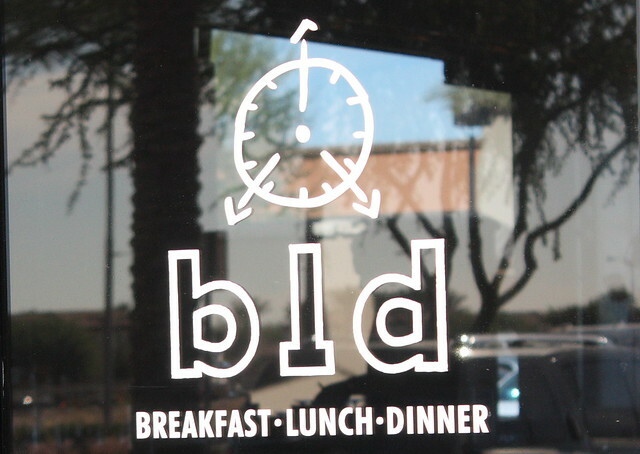 BLD is located in Chandler, Arizona and offers breakfast, lunch, and dinner (hence the name). Their menu is full of my favorite ingredients like goat cheese, bacon, caramelized onions, and heirloom tomatoes. 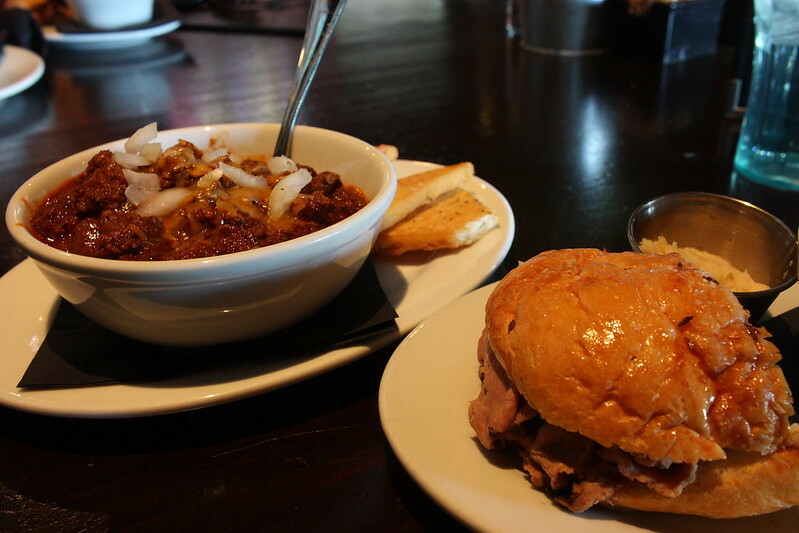 Their portions are huge and the food is well-prepared. You absolutely get your moneys worth when you eat at BLD. Although Joey and I went for lunch, we both opted to order breakfast foods. 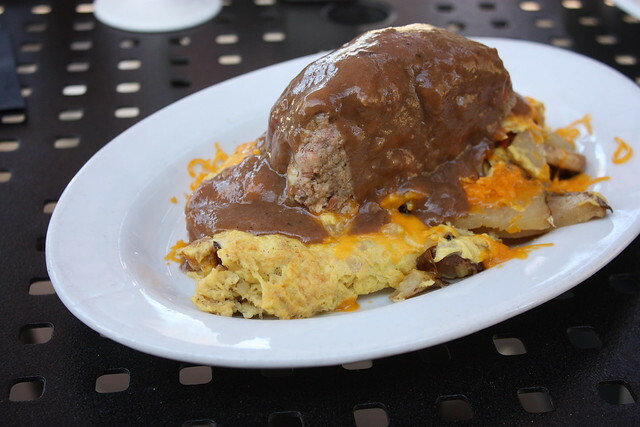 I chose the Breakfast Meatloaf Hash which was composed of mushrooms, caramelized onions, breakfast potatoes, cheddar, scrambled together with eggs, and brown gravy. The gravy had the best smell EVER. I’m usually not big on gravy but the deliciousness that was poured over my breakfast made my heart happy (and the leftovers made my car smell AMAZING). 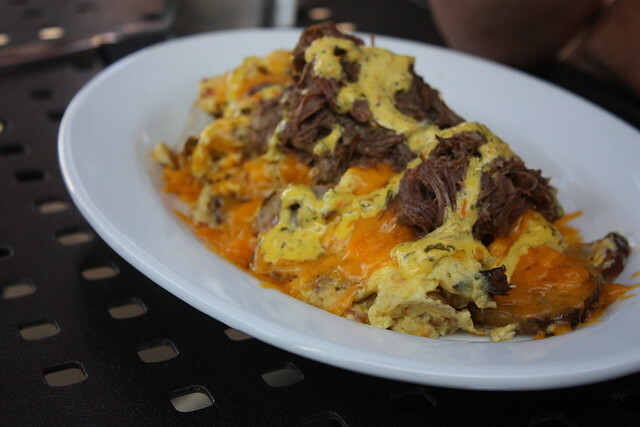 Joey ordered the Hash of the Dog: ham, sausage, short rib, breakfast potatoes, cheddar, scrambled together with eggs, and BLD Spicy Sauce. It looked pretty damn good and Joey cleaned his plate so I’m guessing he was pretty happy with his choice as well. All in all it was a great place to eat. 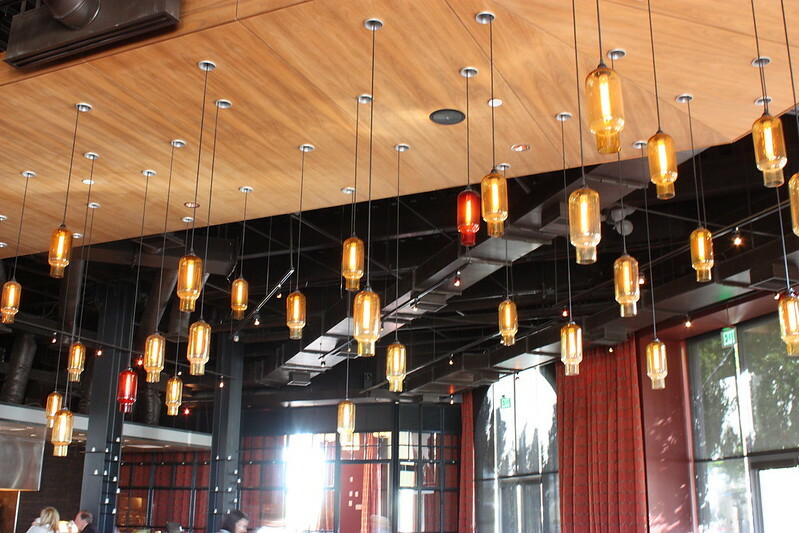 Their patio is spacious and shady from the hot hot heat in Arizona and the ambiance inside looked lovely as well. My only complaint were the vaguely sexist comments from our waiter during the meal. He commented on the fact that it was refreshing to see a woman order something other than a salad then immediately asked if I’d need a to-go box for so much food. He also made the joke several times that women can’t make decisions and my friend should just decide where to sit for us. The comments were funny more than anything but I imagine someone might be offended by them if taken in the wrong context. BLD, I’ll absolutely be back again!